The CAS Online Tutoring offers a variety of settings that are changeable in order to give the users different looks and functions. You can change the name of the activity and the preconfigured tool. The Launch/cartridge URL function will be unavailable. Change the information that is shared with the tutoring tool and access to grades. This activity can either be shown or hidden depending on what you want. Add restrictions from the list below to the activity. 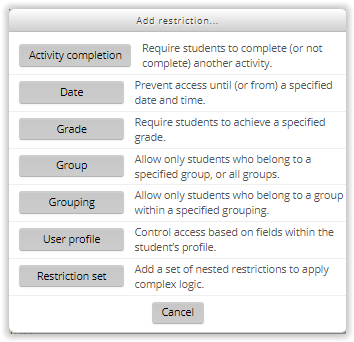 Change the settings regarding the completion of the tutoring activities such as the date or required date.